Teachers often feature graphic novels in college courses, and recent research notes how these texts can help make the process of reading more engaging as well as more complex. Graphic novels help enhance a variety of “literacies;” they offer bold representations of people dealing with trauma or marginalization; they explore how “texts” can be re-invented; they exemplify how verbal and visual texts are often adapted; they are ideal primers for introducing basic concepts of “post-modernism.” However, two recurring textual complications in graphic novels can pose difficulties for students who are writing about ethical questions. First, graphic novels often present crucial scenes by relying heavily on the use of verbal silence (or near silence) while emphasizing visual images; second, the deeper ethical dimensions of such scenes are suggested rather than discussed through narration or dialogue. This article will explain some of the challenges and options for writing about graphic novels and ethics. I am committed to using graphic novels in my English courses. This commitment can be a heavy one–in my case, it sometimes weighs about 40 pounds. If one stopped by my Introduction to Literature course at Kingsborough Community College (the City University of New York), one could see exactly what I mean. A substantial part of the course focuses on Art Spiegelman’s Maus (and Meta-Maus); these texts are often paired with excerpts from Elie Wiesel’s Night and recent critical commentaries about constructing the “canon.” During one class in the Maus sequence, I bring two large bags of books, all of them graphic novels.1 I leave class with a lighter load, since ALL of the students browse through the texts and choose one as an independent reading. Certain texts get snatched quickly: Alan Moore’s V for Vendetta, Kejii Nakazawa’s Barefoot Gen, Marisa Acocella Marchetto’s Cancer Vixen, Daniel Clowes’ Ghost World, Adrian Tomine’s Shortcomings, Frank Miller’s Sin City and Brian Vaughn’s V: The Last Man. Other texts usually require a bit more “selling”: Chris Ware’s Jimmy Corrigan, Shaun Tan’s The Arrival, Joe Sacco’s Palestine, Mariko and Jillian Tamaki’s Skim, Mat Johnson’s Incognegro, Gene Luen Yang’s American-Born Chinese, Harvey Pekar’s American Splendor, Emmanuel Guibert’s The Photographer and, of course, Will Eisner’s classic, A Contract with God. This statement serves to identify a few crucial ways in which teachers and students alike can make active decisions about finding readings that are both serious and appealing. As I consider the article’s references “autonomy” or “relevance” or “reclaiming” certain “transferable” skills, they seem both familiar and convincing; they neatly summarize much of what I aim to do in my daily practice as a teacher. Graphic novels would thus appear to be a helpful resource in a course for non-majors. Yet the term “graphic novel” also deserves clarification, since “graphic novels” are so varied that generalizing about them would be pointless. Thus, my argument will focus on four well-known graphic memoirs: I will directly discuss Spiegelman’s Maus and Bechdel’s Fun Home, and I will briefly note the relevance of Satrapi’s Persepolis and Small’s Stitches. All are memoirs in which an adult tries to reconstruct how the traumas of his or her youth are paired with very painful or contentious family matters. While teaching these texts, I’ve seen ample evidence in support of the five criteria previously noted: improving literacies, discussing otherness, deconstructing texts, analyzing visual culture, and contextualizing post-modernism. Reluctant and struggling readers have eagerly asked for my personal copies of Persepolis II and Maus II, even though these sequels are not assigned. Other students have shared their interests in comics and other forms of visual culture, such as anime and manga, providing us with accessible examples of how terms such as “literature” and “literacy” are far from self-explanatory. Students from highly diverse (and potentially divisive) backgrounds have worked together to explain, for example, how and why religious “veils” are significant or how societies have created complex (and often vicious) associations between people and animals. Noting how these associations are often visualized has lead in turn to discussions of how seemingly neutral and objective images, such as a newspaper photograph, draw from a deep well of assumptions. Such discussions became concrete when we considered two seemingly simple concepts, namely “page” and “scene.” We read Meta-Maus and noted how Spiegelman often drew many different versions of the same page, or we chose a single scene from a text and watched as it is then adapted, as one can see in the film version of Persepolis; after this, students needed little convincing that artists and authors actively “construct” their texts. We have had vigorous discussions of what qualifies as a “literary/non-literary” or “fiction/non-fiction” texts. Can a “comic” (or a Campbell soup can or an upturned toilet bowl) be considered “art?” Can they explain why the best-seller list of the New York Times initially listed Maus as “fiction?” Also, students were often highly motivated when other students spoke boldly of how their experiences inform their reading. Examples abound in the highly diverse microcosm of KCC classrooms, and when students speak of the Holocaust survivor in their family or the reasons why they wear hijab or a decision to “come out” to their family, one can almost feel the room spin as the students’ attention and voices shift to become more attuned to a new revelation. KCC teachers continually try to navigate the various and shifting cultural codes in a college where a “typical” class of twenty-five students might feature a dozen nationalities/ethnicities, an even higher number of bilingual students, and a fascinating range of religious beliefs. It would require a far longer text than this to try to register even a partial set of these cultural variables and to suggest some methods for addressing them in a class setting. My goals are more modest, and will focus on certain distinct formal aspects of graphic novels that may become a crucial part of the process of writing a complex “examination of ethical issues.” Graphic novels surely share numerous formal characteristics with traditional prose narratives; for example, both a graphic novel and a traditional novel might feature multiple narrative lines as well as distinct narrative voices and perspectives. These multiple viewpoints might in turn encourage readers to consider a more nuanced and multi-faceted discussion of ethical issues. However, there are certain features of graphic novels—such as presenting crucial scenes by relying heavily on visual images while offering little or no verbal contexts—which might engage students as readers while also presenting them with a potentially frustrating occasion for doing academic writing. What Do We Write About When We Write about Ethics? The term “ethics” comes pre-loaded with assumptions and associations that often lead people to the sort of impasses mentioned by David Foster Wallace: “Am I a good person? Deep down, do I even really want to be a good person, or do I only want to seem like a good person so that people (including myself) will approve of me? Is there a difference? How do I ever actually know whether I’m bullshitting myself, morally speaking?” (257). In an attempt to settle on a practical way to frame these debates, I have focused on how “ethics” might be discussed in WAC (Writing-Across-the-Curriculum) courses. One current option is to use the term “ethics” to refer to a prescribed code of professional conduct. This choice is more likely for students in fields that lead to some sort of licensing: graphic novels (or at least very reductionist versions of them) have already been recommended for use by students of medicine and law. Columbia University’s School of Continuing Education is developing a more innovative version of this process. It offers an M.S. in “Narrative Medicine,” and courses such as “Giving and Receiving Accounts of Self” focus on medical ethics while also reviewing texts by Henry James and Hannah Arendt and Judith Butler, as well as graphic texts such as Stitches (www.narrativemedicine.org). Other teachers have considered employing graphic novels (or other literary texts for that matter) as a redemptive means of building character or morals or making students “better people.” Scholars such as Martha Nussbaum have long argued that literature can and should have a crucial place in a society’s discussion of ethics. She is very direct in calling for the humanities to play a strong role in directing the moral development of today’s college students. As she states in “Compassionate Citizenship,” “Through stories and dramas, history, film, the study of philosophical and religious ethics, and the study of the global economic system, they should get the habit of decoding the suffering of another, and this decoding should deliberately lead them into lives both near and far” (3). Other scholars, such as Richard Rorty, are suspect of the over-arching narratives that govern the “moral work” that remains implicit in such ethical contexts. As Rorty claims, societies “might work better if they stopped trying to give universalistic self-justifications, stopped appealing to notions like ‘rationality’ and ‘human nature,’ and instead viewed themselves simply as promising social experiments” (193). I am not offering this statement as a one-sentence encapsulation of post-modernism, yet it may help to frame one basic issue facing teachers who try to introduce ethical terms into various assignments. Teachers who try to introduce and clarify traditional terms (perhaps “liberty” or “human rights”) may feel a sense of both urgency and hesitancy while doing so. If one invokes Derrida and places such terms sous rature (that is, liberty), or cordons them off inside quotations marks, or literally erases such terms from the board while teaching, then what replaces them? At the risk of generalizing about KCC students, many seem to prefer their metaphysics and universal values delivered without a chaser of irony or contingency. How then can one speak to students of “ethics” when the term calls forth so many different and contradictory meanings? One particular statement from John Rothfork has helped frame the debate about the contentious status of post-modern ethics. His phrasing seems well-suited for describing how teachers negotiate the many and varied “contact zones” in their classes: “There is currently a fight in America over the operational logic or vocabulary which enables public or ethical discourse to proceed. The fight is over how we—as women, Native American Indians, Buddhists—talk about our ethical performative knowledge” (18). This search for an “operational logic” is indeed crucial, and the reference to “we” suggests how tenuous this process can become. In this case, Rothfork’s initial use of “we” seems to indicate a unified group, but the next phrase reminds us of our shifting and multiple allegiances. As I have read and re-read Rothfork’s statement, I’ve found it hard to isolate and name “the operational logic or vocabulary” that guides the “performative” aspect of ethical discussion (18; italics added). KCC students represent such a diversity of backgrounds that it seems more likely we’ll discuss pluralities—that is, “logics” and “vocabularies” rather than some singular and comprehensive term. When I do ask students to consider ethical questions, I’ve found that there are crucial places in graphic novels that leave us wondering about how this might be done, and both the students and I have found this to be problematic. What might I consider to be a text which provides students with a challenging option for writing about ethics? My ENG 30 course usually features Edwidge Dandicat’s 2004 novel The Dew Breaker, a series of nine interwoven stories. The “dew breaker” is an unnamed 65-year-old Haitian immigrant who lives with his wife (Anne) and daughter (Ka) in East Flatbush near the Brooklyn Museum. A reader need not wait long to find that this man has committed and hidden horrific crimes—namely torturing and killing both political prisoners and completely innocent civilians—during the revolutions in 1960‘s Haiti. He had semi-confessed to some of his crimes to his wife years ago when their daughter was born. Now his secrets are causing all sorts of trouble. His daughter, an artist who had fully believed her father’s stories about being a political prisoner, has created an evocative sculpture in his honor that is about to be sold to a prominent Haitian TV star; his tenant in the basement apartment has recognized the “dew breaker” as the man who killed his parents years ago in Haiti; the Haitian community is openly seeking for retribution against the killers among them; a young college student and rookie journalist named Aline devoted herself to telling the stories of the victims of these crimes; his wife, who had found some consolation in prayer and faith, now believes that she is living a soul-destroying lie. During the final pages of the book, Anne is left wondering whether “reparation and atonement are possible”—and the book then ends without clarifying this for a reader. What do the terms “reparation and atonement” mean in general, and what specific meanings might these words have for these five characters in the book: Ka, Anne, Dany, Aline, and “the dew breaker” himself? Please analyze the varied responses of at least TWO characters. What key criteria or terms would seem most important to these characters? Please make sure to refer to specific scenes and/or statements from the book and to explain their significance. As the students reply to the essay prompt, I am not looking for a firm prescriptive answer about what a character should finally “do,” nor am I expecting that the students will take Anne or Aline or Dany’s dilemmas as a means of achieving some personal epiphany about their own ethical bearings. If I have any particular theoretical framework for my writing courses, it would be that of a socio-linguist, one who is intrigued and compelled by the “code-switching” that we all do while assuming various discursive roles. As James Paul Gee states in Social Linguistics and Literacies, “Any time we act or speak, we must accomplish two things: we must make clear who we are, and we must make clear what we are doing. We are each not a single who, but different whos in different contexts” (124). The conflicting arguments of Nussbaum and Rorty and Rothfork indicate that the ability to firmly define “ethics” remains elusive—yet the deep and recurring desire to try to share even a provisional public exchange of ideas about ethics is undoubtedly what keeps this conversation going at all. Which “vocabularies” are in play in The Dew Breaker, and just who is employing them? Might one start with Anne’s tortured silence as a believer and a cowardly co-conspirator? Or Ka’s hip art-school atheism and activism? Or Dany’s return to Haiti to learn how his parents’ pastoral community deals with their own members’ transgressions? Or the declarations of universal principles from human rights’ groups that are directly quoted in the novel? Or might it be Aline’s decision to look past her academic training as a journalist intern and to now write as an advocate for those “men and women chasing fragments of themselves long lost to others?” (137). While dealing with texts such as The Dew Breaker, students usually can write their way into a fairly nuanced discussion of how ethical decisions can be shaped and informed by culture and language, by images and symbols, by legal codes and social customs. Traditional prose narratives often encourage this process. One reads of a character and notes how their ideas arise in a sequence, one that may not be quite rational and consistent, but one that has its own cadence, structure, phrasing, evasions, echoes. It is this process of speaking and restraining from speech, one that Dandicat calls “coded utterances,” that demands careful attention. How might a similar process take place while reading (and then writing about) a graphic novel? How might the reading of graphic novels complement, and perhaps complicate, the ways in which students read more traditional prose narratives? And finally, how might the reading of a graphic novel present students with a strikingly different perspective? For example, what if Dandicat’s description of Anne’s tormented self-examination featured few or no words? What if readers were presented instead with a few close-ups of Anne’s face and hands as she glanced again and again at the man she believed to be Constant? How might they write their way into a discussion of the ethical contexts for that moment? “Every act committed to paper by the comics artist is aided and abetted by a silent accomplice” (68). As we read Spiegelman’s Meta-Maus, students can work on various topics about trauma, about post-modern memory, about adapting and re-adapting, about the careful composition of every page. The publication of Meta-Maus, with its archival pictures and video and interview transcripts, allows students to see how memory is both retrieved and re-created in a survival tale. How then might students write about moments in a graphic novel when a character/person finds themselves at the edge of an ethical cliff? Maus certainly features many such moments. One obvious context for reading most “survivor tales” is that the author cannot rely too much on suspense. We all know from the start that Art Spiegelman and his father Vladek lived to tell this tale, so the question “Did they eventually survive?” is almost immediately displaced by the question “What did they do to survive?” and some version of its implicit corollary: “And did they lose their souls/compromise their dignity while doing so?” The latter chapters feature a series of almost unbearable decisions facing the Spiegelman family and their friends as they move from one “hole” to the other. In class, we generally focus on three distinct scenes. In the first, the Spiegelman family must decide whether to turn over their elderly relatives to the Nazis for deportation (or be taken away themselves); in the second, a group of Jews hiding desperately in a secret bunker must decide whether to kill a fellow Jew who has found them, and who may also be a Nazi informant. The third scene is given the most careful attention. The Nazis have overrun a town, and they are rapidly approaching the home of Vladek’s sister Tosha. She then faces a horrifying decision, as she must quickly decide whether to allow herself, her two young children, and her nephew Richieu (Art’s older brother) to be captured—or to poison herself and the children (109). Students often respond very strongly to these scenes when we discuss them in class, since they present such painful and irrevocable choices. Yet there are two recurring textual complications in many graphic novels that can pose difficulties for students who are writing about these texts. First, graphic novels often present crucial scenes by relying heavily on the use of verbal silence (or near silence) while emphasizing visual images; second, the deeper ethical dimensions of such scenes are suggested rather than discussed. Students soon notice that Speigelman often uses relatively long and patiently detailed series of panels for seemingly minor events (Vladek’s complaints about his glass eye or his pills or Vladek’s joking with Anja about losing and finding a pillow during a refugee march) while retelling more disturbing events (the death of his own father or even the arrival at the gates of Auschwitz) in very terse and compressed sequences. Perhaps the most extreme example of this is the death of Tosha and Richieu, which Vladek calls the “tragedy among tragedies.” The entire sequence fills less than a page (see Image 1). It’s a very painful and evocative scene, and students are quick to notice how the elimination of details forces one to be attentive to what remains. For example, imagine the tone and volume of the word “NO!” Just note what her face and her collapsing shoulders convey as panels 5, 6 and 7 zoom in closer and closer. Or shudder as she quickly turns from the window, calls the children to her, and _______. (Dare we imagine the details of what follows?) It also challenges the whole premise of the book, that is, how one needs to both “retrieve” and “create” memory. (The news of Richieu’s death was gathered in fragments. Maus II mentions how Vladek and his wife Anja spend months after the war looking for Richieu, unaware of the scene described above.) When I’ve met students again in subsequent semesters, it is often that scene which has formed their sharpest recollections of graphic novels, of representations of the Holocaust, of “the creation of memory,” of our course in general. COMPLEX COMMIX? : The graphic novel Maus obviously challenges a reader’s assumptions about whether a seemingly simple form can fully convey the complex emotions and ideas of people or characters. The book feature a series of scenes in which people must make very difficult ethical decisions. To what extent and in what ways might a graphic novel be more or less convincing or insightful than a traditional literary text while trying to represent the ethical conflicts of such scenes? You may refer to any of the texts we’ve read (or will read), or you may choose your own examples. Here’s where a recurring issue has arisen–students often find it not just difficult but almost impossible to develop a sustained analysis of the ethical contexts for a scene such as the death of Richieu. It’s not that this moment lacks an ethical charge. Yet students have grave difficulties getting past the obvious points that Tosha has two horrifying options (infanticide and suicide vs. handing over herself and the children to face unspeakable violence) and that she is feeling desperate, hesitant, tormented, resigned. Students often struggle to provide an analysis which moves beyond these obvious points How might they move past their initial obvious statements, or, as I might ask in somewhat more technical terms, “What do you/we imagine to be in the gutter?” Don’t look at the text for some rain-filled trench–in the terminology of comics, the “gutter” refers to the literal/imagined “spaces” between panels or other distinct sections of the text, and as Scott McCloud says in his classic text Understanding Comics, “Despite its unceremonious title, the gutter plays host to much of the magic and mystery that are at the very heart of comics” (66). In this scene, the “gutter” between panels 7 and 8 seems especially resonant—the first panel features Tosha in near-collapse from the burdens now upon her, while in the next panel she has straightened up, wheeled around, and started an irrevocable act. “Gutters” get filled with all sorts of things besides basic assumptions about narrative continuity or what some comic artists simply call “closure.” Gutters invite us to fill them with allusions and voices-that is, they become intertextual. As teachers we may need to resist the urge to presume this knowledge of other texts and contexts that lead to a nuanced analysis. As an obvious example, a reference to suicide or infanticide may remind experienced readers of various characters and authors and texts: Hamlet, Sylvia Plath, Henry Scobie, Ernest Hemingway, Rebecca Harding Davis’ “Life in the Iron Mills,” Amy Tan’s The Joy Luck Club, Toni Morrison’s Beloved, Gwendolyn Brooks’ “The Mother.” Many literary associations may be unfamiliar, and even if they are, that brings up a further impasse. My students and I (and dare I say any other readers?) are the ones projecting these assumptions into the lacunae between these panels, rather than actually analyzing the contexts most crucial to Tosha. Might we be vaguely “right” while making certain assumptions about her doubts and terrors? Probably–but as I ask “What’s in the gutter?”, the ethical contexts generally become vague or even remain inaccessible. One should not immediately be dismissive of the use of “silence” in a text, and many readers will already know of Foucault’s dictum that “There is not one but many silences.” However, for writers who are still struggling with the nuances of academic discourse, such “silences” in the “gutter” can lead to a lot of vagueness and potential confusion, and in courses where the development of precise language is so very crucial, this surely matters. 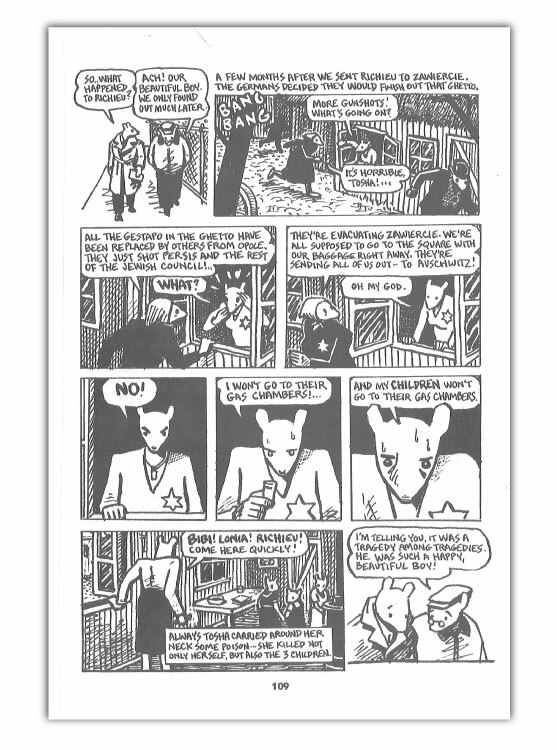 Maus is surely not an isolated example, and it is almost chatty compared to Persepolis or Stitches. For example, a pivotal sequence in Persepolis depicts Marjane’s visit to the jail cell of her beloved Uncle Anoosh on the eve of his execution for being a political dissident. During this full-page sequence of panels, the two are alone in his cell—and Marjane says not a word (69). In Stitches, Small is a told a devastating truth about his place in his family—and this is followed by eleven pages (often referred to as the “rain sequence”) in which not a single word appears (257-268).Of course, this silence is an intentional effect, and an interview with David Small suggests a crucial distinction about visual and verbal communication. He notes, “I like to say that images get straight inside us, bypassing all the guard towers. You often go to the movies and see people with tears streaming down their cheeks, but you don’t see this in libraries, not in my experience at least.” He adds, “If told in words—even if I could have—the story would have lost that visceral impact” (2). Small’s memoir seems to both confirm and challenge some of the suggestions made in the previously cited article from The CEA Forum about assigning reading for non-majors. The text allows for students to find “relevance” in Small’s depictions of family, alienation, trauma, therapy, imagination, and a text that is able to “bypass the guard towers” often gives credence to deeply felt personal narratives. It can be used as a way to move from a “visceral” text to the more verbally oriented texts often found in academic disciplines. Yet teachers still need to be attentive about the “transferable writing skills” that non-majors might learn from these crucial sequences from texts such as Stitches. To be direct, what can we ask students about what Marjane and David are thinking in the sequences mentioned above? If there are “vocabularies” for their dilemmas, how might one know them and comment on them? So could I name a graphic novel which might be less “evasive,” which might employ “gutters” in a way that allows for a fuller discussion of ethical discourse? I would suggest Alison Bechdel’s acclaimed 2006 memoir Fun Home: A Family Tragicomic. The book itself is all about evasion after evasion, primarily about how a closeted gay father and lesbian daughter “speak” of their own sexuality. Both seem to “know” that the other’s public identity is a shadow-play, but for the greater part of the book neither ventures to speak directly of their presumptions–instead, we read of their mumbling and code words and knowing glances. Above all, father and daughter “speak” through books, some given as gifts that seem more like invitations for dialogue, others that are discussed in English courses, others used to suggest what cannot yet be said. Toward the end of the book, Bechdel becomes increasingly aware that these silences are not just awkward but damaging, and she resolves to speak out. A crucial exchange appears on pages 218-219 (see Image 2). In a panel near the top of the page 218, Alison is lying on the couch as her father approaches and asks her to help polish some silver. While in the kitchen they have yet another failed dialogue about the movie Cruising, and the scene could easily be read as a pair of missed chances—the chance for Alison to speak, and the chance for readers to know more of what Alison is really thinking. It should be noted that none of the four books I’ve mentioned use extended dialogues, and nor do the vast majority of graphic novels; often this choice isn’t a rejection of dialogue but simply a recognition that the visual format of most graphic texts simply does not leave much space for verbal exchanges. Also, while memoirs rely heavily on voices, the voices of Vladek Spiegelman, Taji Satrapi, the Small family, and Bruce Bechdel are generally terse and understated. The key difference is that the “gutters” of Fun Home are like over-flowing baskets of interior monologue and literary allusion. Neither of these terms is really adequate here. “Interior monologue” is a barren label for a memoir in which self-conscious over-writing appears on almost every page. Readers need to engage with lines such as “I was adrift on the high seas, but my course was becoming clear. It lay between the Scylla of my peers and the swirling, sucking Charybdis of my family” (213). These brief allusions are often paired with lengthy and direct quotations from writers such Proust, Fitzgerald, Wilde, Joyce, and so many others, which in turn may be contrasted with both images and text from movies, letters, album covers, news headlines, dictionary entries, and her own somewhat neurotic diary. The effect of these methods is that they allow for a much more substantial discussion of an ethical issue. Jill sits across from me saying there is not enough opportunity for heroism over here. I am late coming into this mean old bar full of Americans. Too early for a martini but I have one anyway. Jill is eating a sandwich. Heroism is suspect, I say. She frankly wants to be heroic. “Admit it, you do too,“ she says. I do sometimes. Not now. Now it just seems deluded. Because she has said it out loud. This brief excerpt from Millett introduces the themes underlying the strained conversation that follows: the desperate need to speak, the desire or fear of the “heroism” that this entails, the rising tension between “now” and not now,” the choppy declarations and the continued retreats into a veiled silence. All of these are given resonance, so that even Bruce Bechdel’s derisive “Snort!” becomes significant (219). One of the most pressing issues in contemporary society is that of being “silent.” What are some situations in which being “silent” develops into a complex ethical dilemma? Please refer to the choices of TWO or more people from Fun Home. How and why do they remain “silent?” What, if anything, do they reveal about their silence, how do they reveal it, and what conflicts arise from such revelations? Please make sure to refer to specific scenes or statements from Fun Home (and/or other texts you’ve read) and to explain their significance. In this case, students have ample options besides projecting personal associations into the “gutters” of Fun Home. In academic terms, the students now have more than compelling visual imagery–they also have complex verbal contexts for the sort of investigation that one would hope they will engage in as they take Introduction to Literature. (Or as Spiegelman would say, they have “commix” to draw upon.) Whether the scenes from Bechdel rely on relatively straight-forward bits of narration or on more intertextual references, the students have a much fuller opportunity to write and to analyze, while also reading a very bold, timely and innovative text! “There is no philosophical area that cannot potentially be given a graphic novel treatment” (49). Perhaps I have wound up arguing that graphic novels are best at confronting ethical quandaries when they rely upon seemingly traditional fictional techniques such as dialogue and narration. If that does wind up to be the case, then that might prove to be unhelpful, since there are not many graphic novelists who use the densely allusive verbal references and echoes of Fun Home.8 Of course, those who prefer to use traditional prose texts in a Literature course can find ample support for that choice. One might start with Mark Kingwell’s claim that “On Cartesian principles, we cannot directly know the mind of another; but words printed on a page give us the best possible chance at coming close, better even than interacting with others” (5; italics added). It would seem obvious that graphic artists would soundly reject this premise, and the scholarly articles cited earlier generally presume that this notion of “the best possible chance” is exactly what graphic artists are trying to usurp. However, I was surprised by a comment from Scott McCloud about “gutters” and “closure.” As he states, “Closure in comics fosters an intimacy surpassed only by the written word, a silent, secret contract between the creator and audience” (69; italics added) Consider the various “gutters” that were discussed above. When Tosha turns to face the children, when Marjane sits silently in a jail cell, when David withdraws into his own drawings, when Alison’s attempt to speak is met with “Snort!,” there surely is an “intimacy” created. What can one say about moments? As Kingwell reminds us, this question may be merely speculative, since directly “knowing the mind” of another simply can’t happen. Yet we can at least glimpse a tentative map of that interior by reading what our students write, and if they can’t write much about Tosha’s last thoughts, for example, then perhaps that “intimacy” remains hesitant and amorphous; it is often one based primarily on personal assumptions rather than textual analysis. There are usually a few critical students who agree with him, but the obvious problem is that claims about “something lacking” or “something wasn’t there” or “something more intellectual” can sound suspiciously like the disengaged comments given by someone who doesn’t care for cricket or rap. I am not trying to shame Namie or my students here—I have been fumbling around with my own phrasing for awhile as well. So I have arrived at the tentative conclusion that this absent “something” is not about the five reasons that I mentioned at the beginning of the essay. It is not about literacy or identity or meta-narratives or visual culture or post-modernism–the elusive “something” seems to be the ethical dimensions of reading and writing about such texts. For the many reasons that I outlined earlier, I will be teaching graphic novels again in ENG 30. I will keep in mind Jeff McLaughlin’s article, while also be questioning his basic assumption. There are fascinating things that one can find in the “gutters” of graphic texts, but a fully realized “examination of ethical issues” remains an elusive one. Of course, McLaughlin is careful to qualify his statement with the word “potentially”–and the “potential” of graphic novels to do so many others things is quite strong. When a graphic novel such as Fun Home allows for such a discussion, I will be glad to encourage it, but I will also be wary of assigning students to make such “examinations” of ethical dilemmas when I find myself having trouble doing so. Courses that analyze visual culture are proliferating. Simply google “CUNY courses on visual culture” for a sampling. See Drucker, Graphesis for broader contexts. Readers might try Joe Sacco’s Safe Area Gorazde: The War in Eastern Bosnia or the obscure Gemma Bovary by Posey Simmonds or even Radioactive: A Tale of Love and Fallout, Lauren Redniss’ stunning graphic biography of Marie Curie. Of course there remains Alan Moore’s classic V for Vendetta, which has enough allusions and speeches to keep a graduate seminar busy. Moore’s Watchmen is even more complex, and gives preferences to long-winded dialogues rather than subtle silences; as a colleague once remarked to me, this text doesn’t have “gutters,” it has canyons of highly self-conscious prose interspersed among the graphic passages. Yet these texts are the exceptions, and many recent graphic novels are featuring less and less dialogue and/or interior monologue. Almond, Steve. “Deconstructed–Chris Ware’s Innovation.” New Republic 13 (Dec. 2012): 1-3. Print. Amicucci, Ann. N. et al. “‘You are asking me to do more than just read a book’: Student Reading in a General Literature Course.” The CEA Forum 44, 1 (Winter/Spring 2015): 1-29. Print. Bechdel, Alison. Fun Home: A Family Tragicomic. Houghton Mifflin, 2006. Print. Boatright, Michael D. “Graphic Journeys: Graphic Novels’ Representations of Immigrant Experiences.” Journal of Adolescent and Adult Literacy 53 (March 2010): 468–476. Print. Chute, Hillary. 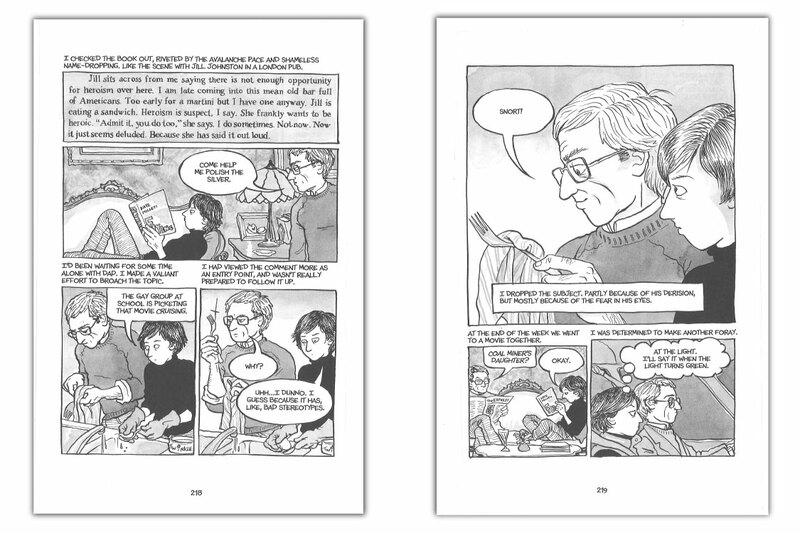 “Comics as Literature: Reading Graphic Narrative.” PMLA 123, 2 (2008): 452–465. Print. Program in Narrative Medicine. Columbia University Medical Center. www.sps.columbia.edu/narrative-medicine. Accessed 15 Jan. 2016. Correia, Daniel. 2007. “A Novel Idea.” City on a Hill Press www.cityonahillpress.com/2007/02/08/a-novel-idea. Accessed 20 Dec. 2015. Dandicat, Edwidge. The Dew Breaker. Vintage, 2004. Print. Drucker, Joanna. Graphesis: Visual Forms of Knowledge Production. Harvard UP. 2014. Print. Gee, James Paul. Social Linguistics and Literacies. Routledge, 1996. Print. “Getting Graphic: Using Graphic Novels in the Language Arts Classroom.” http://gettinggraphic.weebly.com/index.html. Accessed 12 Aug 2014. Hatfield, Charles. “Defining Comics in the Classroom.” Teaching the Graphic Novel. Stephen E. Tabachnick, ed. Modern Language Association, 2009. Print. MacDonald, Heidi. “How Graphic Novels Became the Hottest Section in the Library.” www.publishersweekly.com/pw/by-topic/industry-news/libraries/article/57093-how-graphic-novels-became-the-hottest-section-in-the-library.html. 3 May 2013. Web. McCloud, Scott. “Blood in the Gutter.” Understanding Comics: The Invisible Art. Harper, 1993. Print. McLaughlin, Jeff. “Deep Thinking in Graphic Novels.” The Philosophers’ Magazine Vol. 60 (2013): 44-50. Web. Nussbaum, Martha C. “Compassionate Citizenship.” Commencement Address. Georgetown University. http://www.humanity.org/voices/commencements/martha-nussbaum-georgetown-university-speech-2003. Accessed 15 Aug. 2014. Redford, Kyle. “Graphic Novels Welcome Everyone into the Reading Conversation.” The Yale Center for Dyslexia and Creativity. http://dyslexia.yale.edu/EDU_GraphicNovels.html. Accessed 25 Aug 2014. Roeder, Katherine. “Looking High and Low at Comic Art.” American Art. 22, 1 (Spring 2008): 2-9. Print. Rorty, Richard. Essays on Heidegger and Others: Philosophical Papers, Vol. 2. Cambridge UP, 1991. Print. Rothfork, John. “Post-Modern Ethics: Richard Rorty and Michael Polanyi.” Southern Humanities Review 29.1 (1995): 15-48. Print. Royal, Derek Parker. “Introduction: Coloring America: Multi-Ethnic Engagements with Graphic Narrative.” MELUS (Multi-Ethnic Literature of the United States) 32 (2007): 1-16. Print. Schwarz, Gretchen. “Expanding Literacies Through Graphic Novels.” The English Journal 95 (2006): 58-64. Print. Small, David. Interview. amazon.com. Accessed 15 Jan 2016. David.Smetana, Linda et al. 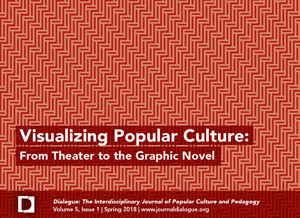 “Using Graphic Novels in the High School Class: Engaging Deaf Students with a New Genre.” Journal of Adolescent and Adult Literacy (2009): 228–240. Speigelman., Art. Meta-Maus: A Look Inside A Modern Classic. Pantheon, 2011. Print. Squier, Susan. “So Long as They Grow Out of It: Comics, the Discourse of Developmental Normalcy, and Disability.” Journal of Medical Humanities 29 (2008): 71-88. Print. Wallace, David Foster. “Joseph Frank’s Dostoyevsky.” Consider the Lobster and Other Essays. Back Bay Books, 2006. Print. Wiesel, Elie. Night. New York: Farrar, Straus and Giroux, 2006. Print.